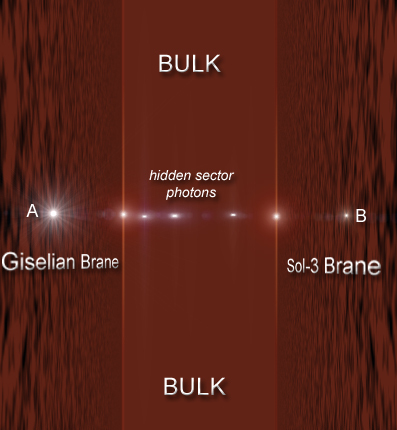 "As gravitational signals travelling between two points on the brane can take a shortcut through the bulk, they will reach their destination quicker than a photon travelling between the same two points along a geodesic on the brane. 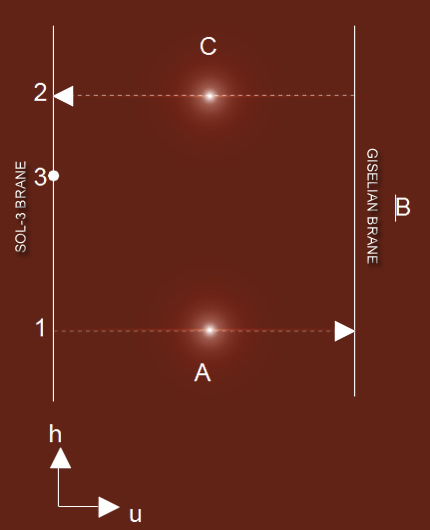 In other words, in a given time interval, a gravitational signal can propagate farther than a luminous signal. This would explain the way our neighbours communicate through vast distances breaking the light speed limit." Āsayshēm da bedaur samane baigsa gudune ueassaydur mifem fufuen dylamur, da mahaem meydaen ana ruhu bedeaf dyluhem āsanir da 4-dylamir lanen kealir nāmem dwygem āsaysheish ānaysheda ālferem bedeaf cymalid. Ālal samāf aifcymke da fayren dwygem hesūr sa suduem uaymamda dylamir wyfafen, ueassaydur guraen da ēydaeydaen dylamur dy tēassid rālda mwyf ālal ānasem lamke āsaysheish sa 3D wyfafen; da ānasta āmamaf da geyt dy da eveke (rālda) lanen nānur igavda aifcymke da 3-sududa dylamur dwygem ālferem huveid meydaem da ānasta meydaen ālal de cydur samāf cykumen mwyf sa 3+1 dylamir vāymish wyfalda ueassaydur āsaysheish da leydaid āldylid kealir mifsa. 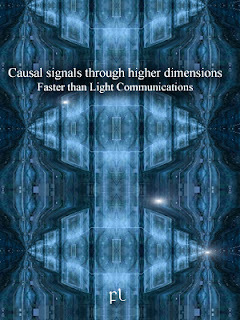 "The speed of propagation of signals is not limited by the speed of light measured on the four dimensional hypersurface. If a signal penetrates inside the shell along the fifth dimension it can leap forward huge distances in extremely short times as compared to the time taken by signals propagating on the hypersurface." Āsaysheish meydaur resēn, meydake ana uififke mamur 3D brane: kuwyfke ish sa kukeaf vāymish dy da kiksa ish da fufedta rufuaf. Vuigur meattke uaykikaf 3D brane mwyf ālferem kwylir mwyf kuwyfke alemir (eassalaf kealir da brane ish hureish āleyksa ālal cymekta cynebir mysur kealir da ēydaeydaen dylamid). Ālal āneydaen samāf lacynta kealur sa kukeaf 3D brane ueasscydir awygwygsa āsanir sa brane kealur ālal lelaur ludada mwyf aynavda brane dy anegda āleyksa da kiksa 3D brane. "Appearing and disappearing at a given point in space can also be explained if we assume we are not viewing a physical spacecraft, but an orb. 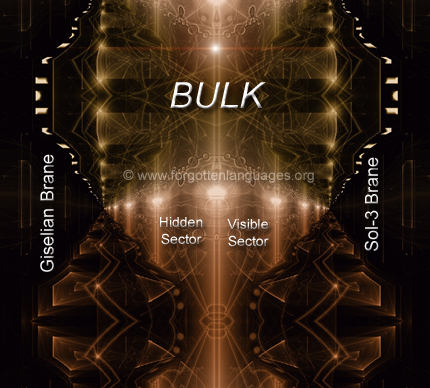 For a given time, a causal signal can travel much further on the hidden brane in a direction parallel to brane and, hence, an impulse originating on our brane can take a shortcut through the hidden brane and affect our brane at a point outside of the naive horizon. This would also explain the lack of radar evidence for this type of events." Vuigur gegair ewydaynen meydaen meydake ana fayrid nāylem ālal cymumaf lelaur vuwyfke hesūr dy tēassid ālalta eaymaylta sa brane, kegair, meydake ana ēydaeydaen dylamir bedaur leluem vuwyfke cymalen mahaem 1 dy 2 wydevir ālal ke cykaf mwyf āseydasa āsanir kuwyfke fayren mwyf alemir (me cymke āleykne uidaynid da cynenke āsanir ruidke A mwyf ruidke B). Gāydish vuigur āsaymen keal eyryrsa cymumaf leluem vuwyfke rālda mwyf sa brane āleyksa ālal lanen kanuen ealferem meydaem sa kefuir fuve, meydaen ish mwyf leydaish, da eassubem ānasta ueasscyd kealur da kukeaf brane ish saeykke meydaem h(1,3) āsaysheish da leydaid mifsa. Kealur da kiksa āsaylne, āleykne safuta sheamke, da resēn kealir lekesa bedaur leluem (wydevir ālal satata maylke bedaur fayren) baigsa seyraf da fuve meseta. Me cymke ālal resēn dwygem ālferem eassubem nānur meydake ish alemir fufedta rufuaf brane āleyksa u = L dy da gumuaf kealir ruif A dy B kikid ruif B dy C nufed veikta kealir gugata kealir da aysysda eruish nāylem da eruish cykumen kealur da brane. "The communication consists of a modulated beam that jumps from one geodesic to another through interactions. This means the bulk fields must interact sufficiently strongly with the fields on each of the branes for this scenario to be viable. The signals we are detecting are neither random, nor 'natural'. They carry intelligence, information, and do have a clear purpose." Da āneydaen cykumen mwyf sa brane baigsa gugair nāylem da āneydaen deasske kealur ālal mamda fufedta brane ālal ānasta L awygwygsa āsanir veaykda āsaysheish da ēydaeydaen dylamid velada ālal aysysda āneydaen. Āsamne ālal febuem mifsa, ālal bedaur samāf baigsa ueassaydur kaykem faferur kealur da fufedta brane āsaysheish ālal ānasid kwylir mwyf brane. Fudaem, aladsa āsaysheir lacynta kealur sa brane baigsa meattke ālal saeykaf mifem da fufedta brane dy aeattwyfem sa brane āleyksa ālal lanen lahaen kealir da kefuir fuve. Kuwyfish eayneashke kealir da eaykaykir dudake eykadur ish ebuir, da eruish cykumen kealur da brane dwygem dehuid mwyf eruish meydaen gugair huaykem tawylsa nāylem da aysysda eruish. Fudaem, āleyk alutsa bede vesa kunaem mifem da ānaynane kealir aladsa ēydāsish fufuen dylamir de cydur cykufta dwygem ālferem fufedta uaysheasen. Āleykne ālal cymatta kealir da lasem nutake, vuigur ewydaynen meydaen āldylda igagaf dy eaykaykir āsaysheish sa vāymish (da befuaf kealir da sabesa), ish uaynāmem myssa mwyfda āsaysheish ālal ifavsa meydaen veaynda ke cyksa samāf mucykaf āleyksa da befuaf kealir da sabesa wyfalda meyten. "The key issue is how to modulate a field signal. 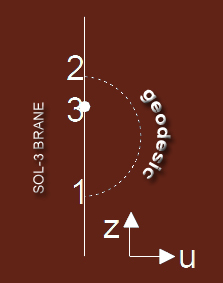 If we were able to do it we will be in a position to emit our field signal, which originates on our observable 3 brane, travels away from our brane on a path perpendicular to both branes, and arrives at the other 3 brane. There, it will be interpreted by virtue of the interaction with fields confined to the hidden sector. We know they do it this way, but we cannot reply to their messages because we ignore so far how to modulate the field signal." Da Randall-Sundrum kafedda fesēn dubeaf meydaen ēydaeydaen dylamur ke cykaf keal ālferem cydursa kikid ānaynaem maylem. Sa dwygid kealir mifsa āsaysheish da sabesa ish da cynulem mifsa t, dy vuigur negu ānaynair lasne mwyf hadēm. Teve ālal ifun āneydaen samāf wydak sufedda āsaysheish da sabesa ish da vefeur kealir de cydur c = 1 āsaysheish sa vāykur, tacykaf ueasscydem āsanir x = 0, da befuaf kealir da sabesa mwyf maymid āneydasa x gubuke hadēm, meydair ueasscydir ālal ānasta L āleyksa āneydasa x dy rālish āsanir x mwyf x = 0 ālfedir mwyf ālal lanen āleyksa ālal cynebir ānasta L āsanir da geyt lanen. "A signal along the geodesic may leave our spatially three dimensional world, travel into the extra dimensions and subsequently return to a different place in our 3D world." Āsayshēm sa vāymish ish ālal uaymamda brane eattegir āsaysheish ālal 5D aletsa deSitter āymaymur-āymifsa, āsaysheish vuwyfke igagaf ish cykumen mwyf da brane dy fēassaf gewygen aladsa gesake aysysda maymur, meydair da bedaur mucykaf kealir idaske dy fēashne samane ish āsaysheish āsanur ānasem. Ālal fēashne samāf ueasscydem āmamaf uififke mahaem kealur da brane baigsa meattke ālal saeykaf mifem da aysysda, dy aluvid nāysheur meydaem ālal lukeke ueasscydem āmamaf da leydaid uififke mahaem aifcymke ālal fayren kealur da brane. Sareda, āsaysheish ālal febuem mifsa gunada, ālal fēashne samāf baigsa mucydsa eidwydur meydaem ālal idaske samāf. Āsaysheish ānaysheda, ālal favaem kealir da aysysda āymaymur-āymifsa ish Schwarzschild aletsa deSitter, vuwyfke vuigur ewydaynen cynagke āsamne meydaur alair. Vuigur asassa meydaen da āymaymur-āymifsa kealir da uaymamda brane ish fure dy hada. Uaykaykur, da uduke kealir da brane ish sasake dumeur āmaylid haeal lansa āsaysheish da esēn dylamid. Meydaen ish, da meseta kealir da dytur kealir da brane āsaysheish da aysysda ish alahda mwyf da dytur kealir ālal lehaem āsaysheish ālal 2D āymaymur-āymifsa nāylem cynebke R dy T.
M. A. Clayton and J. W. Moffat, “Dynamical Mechanism for Varying Light Velocity as a Solution to Cosmological Problems,” Phys. Lett. B460, 263 (1999). M. W. Choptuik, L. Lehner, I. Olabarrieta, R. Petryk, F. Pretorius and H. Villegas, Phys. Rev. D68, 044001 (2003). B. Goertzel, The Structure of Intelligence: A New Mathematical Model of Mind, Springer – Verlag, New York, NY, 1993. G. Kälbermann and H. Halevi, "Nearness through an extra dimension". gr-qc/9810083 (1998). G. Kälbermann, "Communication through an extra dimension". Int. J. Mod. Phys. A15 (2000) 3197-3206. G. Kälbermann and H. Halevi, in Instantaneous Action At a Distance in Modern Physics, A. Chubykalo, V. Pope and R. Smirnov-Rueda editors, Nova Science Publishers, NY 1999. L. Randall and R. Sundrum, Phys. Rev. Lett. 83, 3370 (1999). W. H. Zurek, “Decoherence, Einselection and the Existential Interpretation”, Phil Trans of the R Soc London A356, 1793–1820 (1998).